Foil series that can be used to enhance reflective, metallic, holographic, and many other vinyls. Unlike the opaque GCS foils graphics, GCT foils are spot colours that will not cover a base material's visual properties. Retro-reflectivity, mirror finish, metallic chips, etc. are retained. GCT Foils are compatible with EDGE READY materials. 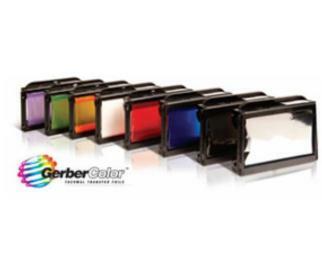 GCT foils are also compatible in overprint combinations (GerberColor Spectratone™) with the following GerberColor Series: GerberColor Process (GCP) SUPER CMYK™, GerberColor Spot (GCS), and GerberColor Medal (GCM). GCM Foils should not be used as the underlayer in an overprint construction. GCT Foils are not recommended for use with Heat Transfer Paper.